With all the glitz, glamour and lights of Las Vegas people often don’t take the time to appreciate the beautiful architecture of the city. The popular hotels and casinos are architectural masterpieces in themselves, but there are many lesser known buildings that are renowned for their design and beauty. From museums and offices to condos and Las Vegas apartments, next time you are in Sin City, take some time to see some of the amazing structures Vegas has to offer. Here is a list of 10 amazing building designs in Las Vegas. This 45-story condominium structure was completed in 2006. The postmodern concrete construction features a curtain wall facade system in a light blue color that mirrors the Nevada sky. Penthouses with private home lift from thyssenkrupp and rooftop patios are on the 43rd-45th floor. Although this is an apartment / condo style residential building, tenants also have restaurant, fitness center and private parking amenities. This postmodern concrete construction design, boasts an exposed facade finished in stucco. The 38-story building was once the tallest condominium building in Nevada. The building is totally residential and has parking for Las Vegas apartment owners. There are now three other buildings in the complex–Turnberry Place Two, Three and Four. One of the most unique features of this building is the obvious external visual aspect of New York, New York Hotel in Las Vegas. The hotel is owned and operated by MGM Resorts International and this 150 foot tall hotel began construction in 1994 and opened to guests in 1997. The external architecture was designed around the New York City skyline which includes the Empire State Building, Chrysler Building and even includes the Stature of Liberty with a replica Soldiers and Sailors Monument. Another of the hotels amenities is the full size roller coaster that wraps around, through and inside the hotel. Known as the ‘Manhattan Express, this roller coaster travels up to 67 mph, is 203ft tall and has a maximum drop level of 144 ft. – that is more than half the height of the roller coaster in itself! This 5,000,000 square foot building was designed as a show case for home furnishing and decorating suppliers. The plans call for a total of 8 buildings when the project is completed. The final project will include enclosed skywalks connecting all buildings and parking for visitors. Currently non-trade visitors are allowed accessed to the Design Salon when Market is not in progress. Market for professionals in the interior design and decorating industry is held every summer. This building has a combination of materials and design features that make it an interesting property to visit. With neo-classical design features popular in the 1930’s, the exterior facade materials include brick, concrete, limestone and terra cotta. It is a low-rise building with steel construction. This building is undergoing some remodeling and is used as a museum today. Located on Fourth Street, the Bank of America Plaza is a 17-story, international styled building with a glass curtain wall facade. The high-rise building is only used for commercial office space and business activities. It has a seven story-parking garage for occupants and clients’ convenience. 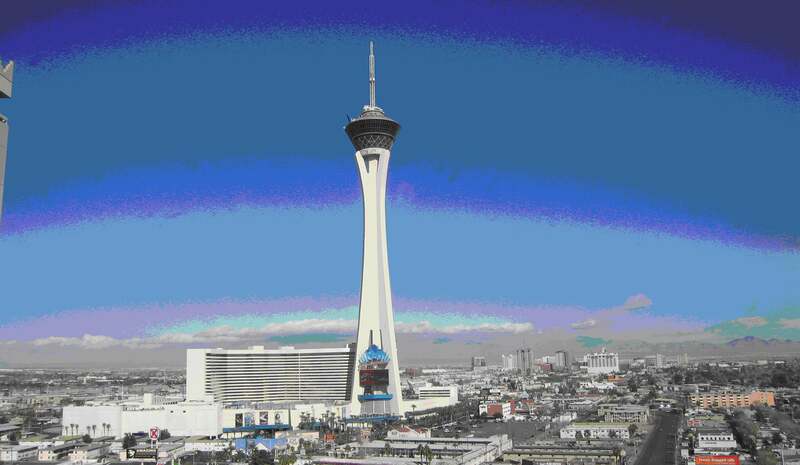 This tower is part of the Stratosphere Hotel and Casino. The building offers something for everyone. The upper floors house a wedding chapel, an “amusement” ride and fantastic views. There is a ride for thrill seekers that pulls you 160 feet up the mast and drops you at 45 miles per hour. Touted as the tallest freestanding structure in North America, the upper floors of the building offer additional rides for the brave at heart. This 17-story hotel and casino underwent a three-year renovation in the 1990’s to restore some of the modernism style architectural features. The stain glass windows came from Lillian Russell’s mansion and there is a Pullman car (circa early 1900’s) that was used by Teddy Roosevelt. The high-rise building also boasts the only downtown micro-brewery. You will find many architectural and design features in the building. This modern facility was built in 2003 and has the largest open ballroom (without columns) at 100,000 square feet. With just over one million square feet of space under the roof, this convention center is large enough to house a convention of almost any size. The expansive building has facilities to host training seminars, trade-shows and business functions. Located at 315 South 7th Street, this academy was originally the Las Vegas High School. The simple art deco building showcases some unique features, including the concrete cast and stucco friezes. You will enjoy the detailing in the medallions and animals. Las Vegas architecture offers a broad spectrum of design features and styles for your enjoyment. Las Vegas apartments, homes, condos, hotels and commercial buildings all add to the unique community that significantly creates and makes Las Vegas what it is today. What you thing about 10 Amazing Building Designs in Las Vegas? anugerah skrin y amat membosankan…boasannnnnn….lofa n awal sebagai pengacara tpi dh jdi mcm tunggul kayu…org lain plk y lbh menonjol…dlm ramai2 artis y d atas tu..baju diana rafar jer y cantik..rosnah n didie knpa jdi cam tu..x sado ke y awak tu dh tua…Well-loved. Great advice. I’m having a makeover at my bedroom and it helped a lot. Very inspiring i think. Glad that i found your site today. I’ll bookmark this one..